(L) Lt. Daniel Ginion, 32, and (R) Sgt. Sean Devlin, 42, at McPherson Square Branch Library. For now, McPherson Square is quiet. The park surrounding the historic library is no longer crowded with young people from all over injecting heroin. The bucket of the volunteer who scours the grass daily for syringes is far from empty, but it's not nearly as full. And the Narcan that the librarians keep in a drawer at the circulation desk has sat undisturbed for almost two weeks – longer than anyone at the library can remember since April, when they took it upon themselves to be trained in the overdose-reversing spray. No one has been overdosing on heroin at McPherson Square Library. At least not for now. "Word is out not to be getting high in the park," said Sterling Davis, the library's security guard manning his post on the terrace. The police have descended, patrolling on foot, in cars, and even on horseback. It's been that way at McPherson since Police Commissioner Richard Ross visited the library last week. He had read about the library staff that was dashing into the park on a near-daily basis to save the lives of overdose victims. About the drug tourists who come to Philadelphia for the high said to be purer than anywhere else – and land on the library lawn. "Sometimes you just got to see it for yourself," the commissioner said. The visit, he said, brought the crisis ravaging Kensington – and everywhere – into sharper relief. He thanked librarian Chera Kowalski and Davis for helping to save eight people in two months. And he heard from a sergeant patrolling the park, who had used Narcan to revive a man from New York, just blocks from McPherson. "What, you don't have heroin in New York?" Sgt. Sean Devlin had asked. Yes, the man answered. But not like the heroin in Philadelphia. "And it's nothing but a train ride away," the man said. And so now children playing on the library terrace gawk at the mounted police trotting through the park – as do some heroin users who have been frightened out of the park proper, but still shoot up along the square's low ledge. Ross said his officers had made progress in recent years – and had dedicated more resources to the park before it became news. Now, they will dedicate more, at least as long as they are able. "Clearly, we want to prioritize and clean up the park," Ross told me. "We want to work with the city agencies and the community-based organizations to get it back up and running where people can feel comfortable." 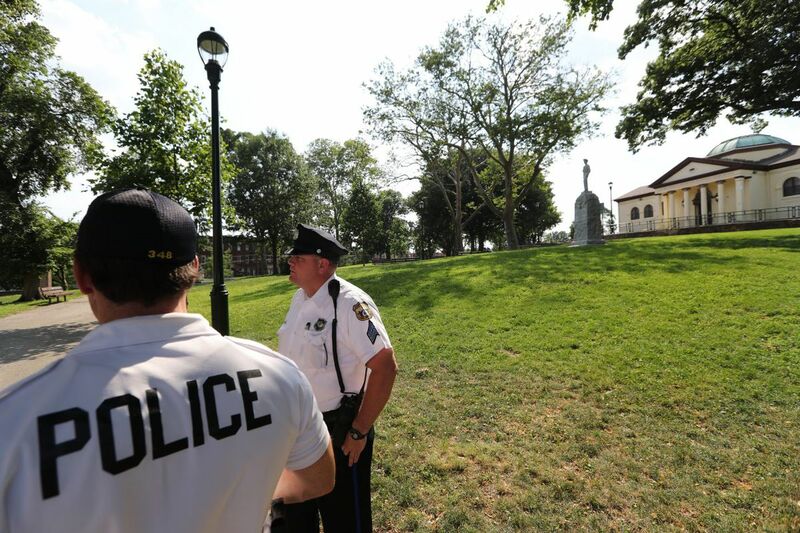 Just a few years ago, the city had sought to revive the park with a playground, new lighting and trees – and more policing. But then the city made the mistake of looking away, Managing Director Michael DiBerardinis told me. As they did, heroin exploded. On Tuesday morning, a herd of city officials and police brass visited the library, outlining for staff the additional resources that are coming: a large mobile police van and a social services outpost that will be set up away from McPherson, so the park and library, they pledged, will belong to the kids. "We lost our focus – we thought we had it down," DiBerardinis told me of McPherson. "We've lost ground and we're going to get it back." That challenge applies to all of Kensington, of course. Especially with the city's announcement Thursday that it had struck a deal with Conrail to shutter and clean the heroin encampment that sits along the railroad tracks, a few blocks from McPherson. Just as policing cannot alone solve a public health crisis, the challenges that come with pushing the crisis into the daylight are clear all around McPherson Square. During one of my first visits to the library, I watched Kristen Allen – who is addicted to crack and was sleeping on the library lawn – help a librarian save an overdose victim. Pushed from the park, her companion now injected himself with heroin on the sidewalk outside. The people on the lawn, she said, are now sleeping in abandoned homes, under the train tracks, or in nearby parks. "Everywhere," she said, before making her way into the neighborhood. There have been many people in Kensington who never looked away. People who have been fighting against the heroin overrunning their neighborhood – and for the basic necessities so many in the community need: food, jobs, decent places to live, a safe park to play in. And they feel their fight has been overlooked amid all the descending cameras and reporters capturing scenes of devastation. They are right. They want others to know that they are fighting – and making what progress they can – so others will fight along with them. That amid all the suffering, there is hope and life. Elisa Roche-Rodriguez is community outreach coordinator at Impact Services Corp., a neighborhood-revitalization group in Kensington. For a decade, she worked along with her mentor, Awilda Ocasio, and the library staff to build up McPherson Square. They fought for the lunch program and the park improvements. They reminded kids that if a neighborhood isn't great, together they can make it great. They organized park festivals and karaoke nights – a neighborhood favorite – and, for a time, a summer camp that took kids on miniature-golf and roller-skating trips. The kids loved it, she said, but it ended because the $25 fee was too steep for many families. After Awilda died earlier this year, Roche-Rodriguez stepped into her mentor's position. "I have learned to never give up – to keep fighting," she told me at the library last week. "Because children here should not have to go outside the neighborhood to enjoy such a beautiful park and library. They should be able to be kids." For now, at least, McPherson Square is quiet. For now, the word is out. But, Sterling Davis, the veteran security guard, still mans his post. "They're gone for now, but they'll be back," he said, scanning the park. "They're just on break."